The manufacture of that popular species of theatrical entertainment known as “musical plays” has the course of years become at last so entirely matter of rule of thumb that one has long ago given up the idea of looking for any sort of originality, either of musical or dramatic invention, in this particular class of entertainment. Thanks, however, to its composer, Mr. Leslie Stuart, the “Florodora” of Mr. Owen Hall proved a happy exception to the general run of “musical plays,” and thus merited its enormous popularity more than most things of its kind. The mere fact of the tunefulness of the “Florodora” music would, of course, in itself not differentiate it from a host other such pieces. The distinctive merit of Mr. Leslie Stuart’s melodies is the piquancy and often unexpected character of their rhythms and harmonisation, which lends quite an air of freshness and originality to music which is itself of the lightest and brightest nature. The most felicitous example of Mr. Stuart’s peculiar skill is undoubtedly the famous number, “Oh, tell me pretty maiden,” which proved as popular as ever last night, but there are other numbers in “Florodora” which also happily reveal the composer’s knack as melodist. It is some time now since this entertaining little play was last seen here, but judging reception it received last night Mr. J. Bannister Howard was wisely prompted in getting together a new company for a revival of the piece the provinces. The performance last night was enjoyable and attractive, principals and chorus alike working with a will for the success of the whole, while the mounting of the play left little to be desired. Benefits are the order of the night at the Crystal Palace this week. On Monday Mr. A. E. Passmore , the Widow Twankey, had a benefit; Tuesday was devoted to Miss Lily Gullick, Wednesday to Miss Lillie Lassah, while this afternoon (Thursday) Miss Nellie and Miss Gladys Ray will share, Mr. Arthur Poole being the beneficiary in the evening. The Onda Brothers claim the Friday evening. One could hardly realise that he was witnessing the first performance of the pantomime at the Crystal Palace yesterday, so well did those engaged fall into their various parts. This year “Aladdin” has been chosen by Mr J. Bannister Howard as the subject, and with the assistance of Mr Fred Bowyer to furnish the book and lyrics, a very entertaining piece is the result. The story runs upon the old, old lines which have been so familiar for years. From the first scene – there are a dozen in all – to the last, all are exceedingly pretty. Many clever changes take place, all being smartly managed. Of course, the cave is about the best, though the Throne Room in the Emperor’s Palace runs it close for effect. Quite up-to-date too are some of the ideas introduced, for in one scene the career of a motor car is shown by means of the cinematograph. To Miss Lillie Lassah is entrusted the port of Aladdin and as she is possessed of a fine voice and the ability to dance, one could hardly wish for a better interpreter of the part. As the Princess, another clever principal is found in Miss Lily Gullick, who also sings and dances well. The comedians evidently intend that the piece shall not lack in fun. As Abanazar, Mr Arthur Poole has a fine part, in which he brings out all the points possible, his by-play and gag being especially good. Mr A. E. Passmore, in the character of Widow Twankey, revels in his part, and two splendid artists of the knock-about order are the Brothers Onda. Their performance on the horizontal bar stamps them gymnasts of no mean order. Other parts are in the hands of Miss Nellie Barnwell (Pekoe), Miss Gladys Ray (Petti-Sing), Mr Prank Weir (Wishee-Washee), Mr E. Oxlee (Emperor), while several excellent glees are rendered by the XL Quartette. GAIETY THEATRE. — Managing Director, Mr George Gaze. — Mr J. B. Mulholland’s successful pantomime Robinson Crusoe was brought here on Monday, and attracted a well-filled house. Miss Chummie La Mara sustained the title-role with marked ability, and secured rounds of applause for her songs. Mliss Eva Hamblyn as Polly Perkins acted prettily and sang pleasingly, though suffering from a slight hoarseness. Mr Charles Gardener was deservedly applauded for his clever business as Dame Crusoe. Mr Gus Wheatman gave a grotesquely humorous performance as Captain Spanker, whose mate, Jack Mainbrace, had a sprightly exponent in Miss Rose Hamilton. Mr George Fisk played with much energy as the Cannibal King. His daughter, the Princess, was pleasingly acted by Miss Lillie Comyns. Mr Joe Ellis was a good Man Friday. The Grovini Troupe are clever acrobats. Mr H. Mansfield as Vanderdecken was well appreciated for his singing. Miss Lily Twyman was a pleasing Fairy. Some good dancing was exhibited by the Misses Nita St. George, Lavurnan, Lily Piercy, Gladys Ray, Claire Tenson, Flo White, and Sisters Wilkinson. A strong and well-balanced chorus sang effectively. The scenery is very pretty, and the dresses and appointments harmonise well. It is welcome news to learn that Mr. Bannister Howard intends to revive old-fashioned pantomime at the Crystal Palace Theatre. That style of entertainment which has been called pantomime during the past few years has become rather boring, and has not been particularly amusing, either to grown-up people or children. Any effort, therefore, to return to the rollicking performances of bygone days deserves to be supported, and no doubt Mr. Howard’s enterprise will be crowned with success. The subject of the pantomime is the old favourite story of “Aladdin,” and in the hands of so experienced a pantomime writer as Mr. Fred Bowyer, great things may be expected. No expense is to be spared, and an excellent company has been secured. Miss Lillie Lassah will impersonate Aladdin; Miss Lillie Gallick; the Princess; Mr. Arthur Pool, Abanazar; Mr. A. E. Passmore, Widow Twankey; the Ongar Brothers, the Policemen and Speciality turn; Miss Nellie Barnwell; Second Boy; Miss Gladys Ray (a sister of Miss Gabrielle Ray, who was originally brought out by Mr. Howard), Second Girl; Miss Josephine Sullivan, a Fairy; and Mr. J. D. Cawdery, Demon and Clown, who will also work the traps. He was at one time with Conquest, and is one of the oldest trapworkers left. The Harlequinade and Shadow Pantomime will be a strong feature of the entertainment. The Pantomime will be produced by Mr. C. Lake, and Mr. Joseph Sainton will compose and arrange the music. Mr. W. E. Sharpe will still continue to actively manage the front of the theatre. One of my main interests is a love of old pictures and postcards that give us a brief glimpse into a past and often forgotten age. Collecting old postcard and pictures enables the viewer to glimpse a brief moment from that individual’s life; often far removed from their own either by the passage of time or social class. Social History, often described as “history from below” shows everyday people, their social structure and the interaction of different groups; like the wealthy and politicians these people helped shape and maintain society and so shape history. Examining the images one can’t help but wonder how the individuals lived, were their lives hard compared with today and were they happy. Often the images come with little or no information that can answer these questions, one can only imagine. With each image saved and seen by others, so that moment, that person is kept alive, our understanding is increased and so our lives are enriched. A picture is often more descriptive than words can ever be, but how true is this, if a picture enables us to gain entry to another time, another world, will, like the view from a different window, even in the same house provide a different image? These images allow a glimpse into another time, another era; but what preceded or followed this image? As the individuals were positioned and posed like an artist’s model is what we see truly reflective or like the slightly softened image of an aging beauty a less that truthful representation? I am reminded of a documentary I watched several years ago regarding the returning troops from the front during the First World War. The camera images show a broken, demoralised sea of humanity, young men who having seen images that most of us hope never to witness had lost that sparkle; that zest which only youth has. But bring on the news camera and that battered returning group came to life, the smiles returned and even though muddied and bloodied their heads and bodies became erect, their arms swung in time and they demonstrated a swagger that spoke of courage, defiance and determination; an image that gave hope to the viewer. It seems to me that even in the early days of photography all was not what it appeared and now in the advancing digital age a picture may paint a thousand words but will it be factual or fiction? My interests And collections vary from Maids, Nuns, religious dress and the more risqué images of the French Maid. Often when searching for a particular subject the boundaries cross and as well as true Maids we find Edwardian actresses dressed as Nuns or Maids. During one of my searches I came across Gabrielle Ray dressed as a Maid, “Susan” in Lady Madcap and was instantly captivated by her. Searching for information about Miss Ray I discovered that she was one of the most photographed women of the Edwardian era and described in “Temps” as the most beautiful woman in the United Kingdom; but sadly her success, if measured by being visibly working or in the public eye was short-lived. She struggled with depression and alcohol abuse, and her health declined. In 1936, she suffered a complete mental breakdown and was institutionalized for nearly forty years; dying in 1973 at Holloway Sanatorium at the age of 90. There are several other sites and blogs dedicated to the memory of Miss Ray and my intention is to share my small but growing collection of pictures and postcards with anyone who shares my interest. Reading about Miss Ray I was saddened that this lady, like many others before and since, after a brief moment in the sun they are soon forgotten. Hopefully as people view and enjoy this blog her memory will remain alive for a little longer. I have started to write a short Biography about Miss Ray which I will try to update as frequently as possible. The Index page will show any updates under the Biography catagory. 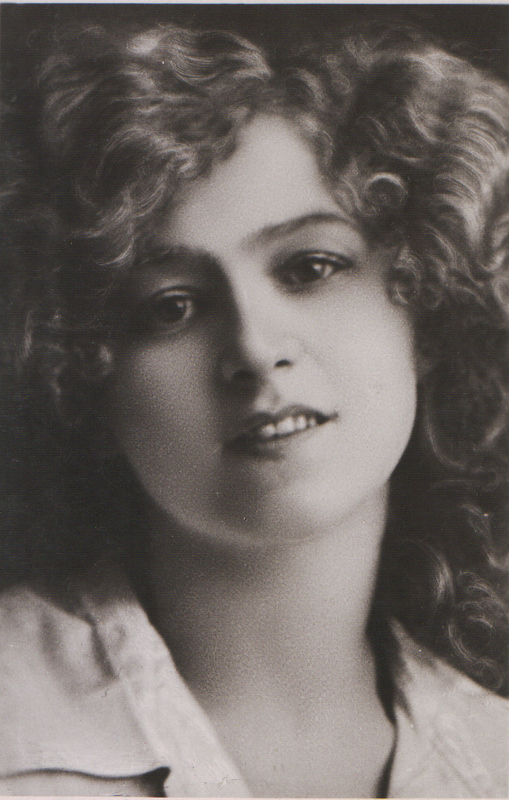 I have also tried to link the various postcards and pictures to the plays in which Miss Ray appeared, however I realise, after several errors that this isn’t an easy task as many are decorative studio poses rather than production images. The individual Rotary, Philco and other publishers numbers are included with any description which should make searching for a particular card or ones from the same set easier. If I have made any glaring errors please feel free to let me know. Thank you and I hope you enjoy my collection as much as I do.